The Los Angeles Chargers plan to put LB Denzel Perryman (ankle) on injured reserve on Monday. Though Perryman underwent surgery last week, the team plans for him to return during the regular season. Perryman’s overall grade of 70.7 ranked 44th of 88 qualifying linebackers last season. His production dropped off from 2015, Perryman’s rookie year, where he earned a grade of 82.4 and ranked 15th at his position. 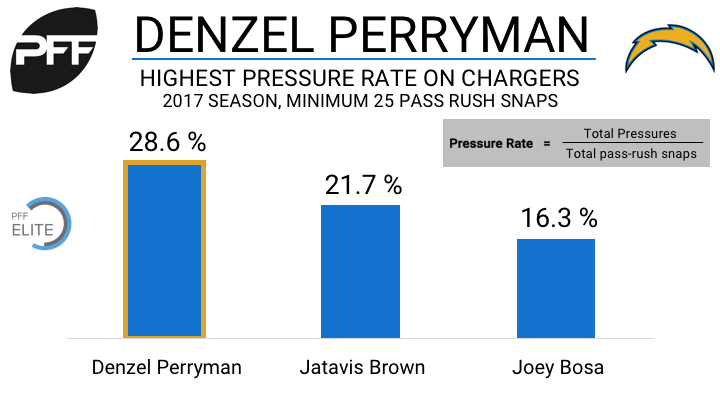 While his snap total (403 to 481) and snap percentage (40.9 percent to 58.6 percent) both increased from 2015 to 2016, Perryman had 10 fewer defensive stops and nine more missed tackles in his second season. He did however increase his pass-rushing productivity, tallying eight total pressures on just 28 pass-rush snaps in 2016.